I used to eat at a Dallas restaurant where the wine list was, to put it politely, pretty sad. This is not uncommon, of course, since too many restaurant owners tend see wine as an aggravation and not a way to please customers. It was frustrating that that the wine list had very little anyone would want to drink, since I liked the food and prices were quite reasonable. 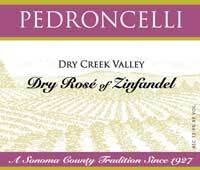 Fortunately, the Pedronceilli rose was on the list, and I drank a lot of it. Like almost every time I ate at the restaurant. And why not? The rose ($10, purchased, widely available) paired with the food that I ordered and it was cheap, especially for restaurant wine. Best yet, the wine was — and still is — well made, with some cranberry and currant fruit, a bit of juiciness in the middle, and even some heft. This is not a light rose, but one with body, and it’s almost as if there are tannins lurking in the back to remind you this is a dry wine and not that pinkish stuff. Chill this (especially this summer) and drink it on its own or with any summer food — burgers and barbecued chicken come to mind. And be glad that one restaurant owner had the good sense to have one quality wine on his list.